The AccuScale Series bench scale plate and frame lab filters provide customers with the optimum solution for plate and frame scalability. AccuScale bench scale plate and frame filters are available in 4 inch (102 mm), and 8 inch (203 mm) square configurations. Filter sheet changeover can be accomplished easily and in a minimum of time. Even more versatility can result from the use of dividing heads to provide double or even triple serial filtration in a single pass. These 4 and 8 inch square plate and frame filters are sized for bench top mounting. These filters are designed to work in a wide range of high efficiency, ultra-fine filtration applications, and have excellent scale-up capabilities. 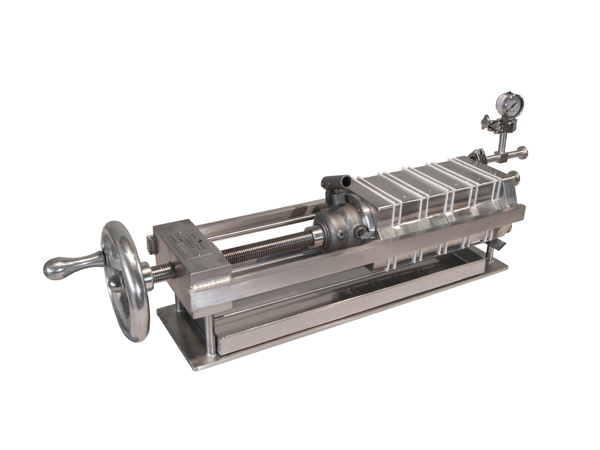 As with all ErtelAlsop plate and frame filter presses, the 4S and 8S have the same component flexibility as other plate and frame models – accepts various thickness filter media, and is internally ported eliminating the need for gaskets as well as concerns about compatibility and cross-contamination.